At the IAA CV Show press preview event in Frankfurt, Joachim Drees, CEO of MAN Truck & Bus AG, reported on the challenges in urban logistics following a survey conducted by MAN Truck & Bus and Volkswagen Commercial Vehicles entitled “What Cities Want.” Its primary aim was to generate relevant and practicable concepts for urban logistics in 2030. The scenarios examined were elaborated together with ordinary citizens, political decision-makers and other experts, who then assessed the designs. MAN has a strategic interest in the overall system of mobility and to shape its future, the company has established a private and public partnership to develop holistic solutions for the urban logistics of tomorrow. Mr. Drees reiterated that something needs to be done to cope with the projected population increase in the main cities, as the additional residents need to be served with all commodities and deal with the resulting waste/refuse disposal. He also mentioned the high demands on logistics and courier providers relating to e-commerce, and that growing aspect of business has its challenges too in meeting expected delivery targets and handling a high percentage of returns. Germany is experiencing a 30% rise in business from the Internet which has now reached €3 billion annually and growing. One of the solutions suggested from the study was the adaption of electric delivery bikes for the so-called ‘last mile delivery’. 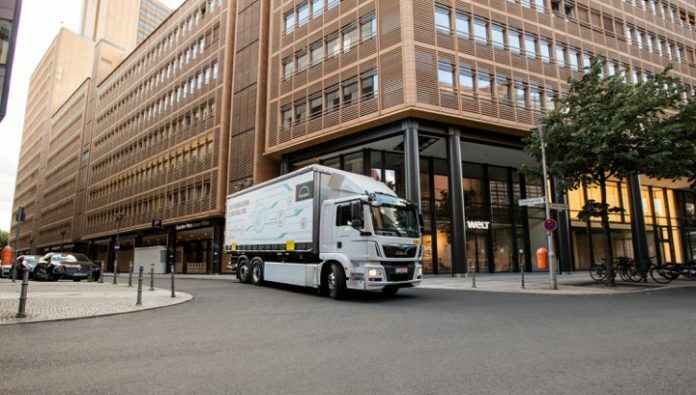 Field trials are underway in German cities led by major logistic suppliers and high profile trailer/body builders. Another smart idea was the usage of passenger transport/commuter vehicles for delivery purposes during off-peak and night-time services.